A common form of evanescence wave detection used for biosensor applications is surface plasmon resonance (SPR). Ligand association (and dissociation) to surface-bound probe molecules is detected by changes in the refractive index of evanescence waves within a thin metal-coated quartz sensor adjacent to the sample flow chamber. This method is primarily used to study kinetics of proteinprotein and protein-DNA interactions. Several reports demonstrate that SPR can also be used to monitor DNA and RNA hybridization. For example, Feriotto et al. showed that SNPs associated with thalassemia could be distinguished by using PCR-amplified samples from normal, heterozygous, and homozygous thalassemia patients as the surface-bound molecule. 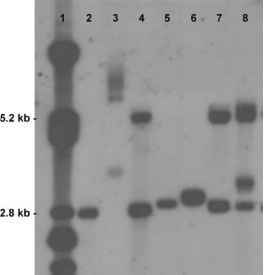 Probe-target hybridization took 5 min per sample to read, and 1 to 3 mg of each PCR product was used. Surface plasmon resonance has also been applied in a microfluidics array format to detect 20 fmol of 1731-nucleotide RNA transcribed in vitro from the uidA gene of a transgenic Arabidopsis thaliana plant (20 nM in 1 mL). The shift to array format and the significant reduction in sample size are improvements for SPR use as a tool to examine genetic mutations or gene expression. The requirement for specialized equipment, however, may limit the applicability for clinical use. Acoustic wave biosensors measure mechanical wave propagation at the surface of a piezoelectric sensor that is sensitive to changes in mass, surface charge, and viscoelasticity. As a demonstration of concept, Furtado and Thompson showed that eight synthesized 25-mer target DNAs each with a different single nucleotide mismatch could be discriminated in less than an hour. Increasing sensitivity to DNA hybridization or observing transcription at single nucleotide resolution may be achievable with these real-time resonance detection methods if they were coupled to a second detection method such as fluorescence microscopy.